During this 18 day fully supported climbing expedition, you’ll summit the highest peak of Mongolia at 4374m and the other 4 Holy Peaks of the Altai Tavan Boyd. Mongolia’s western frontiers with Russia and China are guarded by the snow-capped peaks of the Altai Tavan Bogd mountain range, the highest in the country. Its highest and most interesting peaks are Khuiten, Nairamdal, Malchin, Snowchurch, and Ulgii. The longest glacier of Mongolia, the Potanin glacier stretches for 19km from the eastern face of Mt. Khuiten. On the summit day, when on the top of Khuiten, you will be able to glance into Russia and China. The local Tuvan herders will act as your camel caravan handlers and porters and will make an unforgettable company as they share their unique culture and traditions with you. Arrival in Ulaanbaatar (UB), the capital of Mongolia and transfer to a centrally located 4 star hotel. An afternoon guided city tour will introduce you to the highlights of the city: the Gandan Temple (the city’s main Buddhist center), the central city square with a grand statue of Genghis Khan and the Zaisan Memorial, an elevated hill on the city’s edge providing a panoramic view of UB. Then choose to visit one or two museums from the following: Museum of National History introducing Mongolia’s history from early humans to modern era, Natural History Museum with a unique collection of dinosaur fossils, Choijin Lama or State Oracle Residence-Museum displaying the best samples of Buddhist artwork and religious masks. The Winter Palace of Bogd Khan showcasing rare statues of Buddhist deities and items of personal use of this last theocratic ruler of Mongolia is also worth considering. An evening show of traditional music, throat singing and contortion at 6PM will be followed by a welcome dinner. DAY 2 : Mount Tsetseguun (2256m). Return to Ulaanbaatar. Today we will stretch our legs with an acclimatisation hike over Mount Tsetseguun (2256m), the highest mountain in Bogd Khan National Park, which lies just to the south of Ulaanbaatar. Bogd Khan National Park was founded in 1778, making it one of the world’s oldest protected areas. The hike to the summit takes about 3 hours, through forests of larch and pine and the panoramic views make the summit a worthy lunch spot. We return to UB by a similar route. DAY 3 : Walk in the Terelj National Park and return to Ulaanbaatar. Today we will head out to Terelj National Park. There are some excellent hiking options in the National Park as well as the chance to ride on horseback. Terelj, a National Park since 1994, is a very impressive, wild landscape with unusual rock formations and wildlife – inlcuding moose, bear and an abundance of birdlife. We return to Ulaanbaatar. Early this morning we take a 3 hour flight to Ulgy town in Western Mongolia. The Kazakhs living in the area are the largest national minority and practice Sunni Islam. A number of other ethnic groups also reside in the province in the region. Upon arrival, we meet with a support team of driver(s), cook(s) and a guide and head westward to Tavan Bogd National Park. At the end of a 3 hour travel across mountainous desert, we camp in the valley of Sogoot River. In general, rivers in Mongolia are small and shallow and occasionally dry up, but during the rainy season they rapidly rise and at times burst their banks. Upon arrival we erect our tented camp. It is guaranteed that curious locals on horse or foot will appear out of nowhere to greet you. Dinner and overnight in tented camp. Today we travel further west and by early afternoon we reach the Oigor river valley, the gateway to the Tavan Bogd peaks. En route, we try to visit a Kazakh family, male members of which practice falconry. They employ Golden Eagles for hunting foxes, hares and other small animals. Today we trek to the base camp of the Tavan Bogd. This gradual ascent takes us through a high mountain terrain of rock outcroppings and wetlands. With a bit of luck you will see some of the wildlife that inhabit the area -including marmots, hares and a number of birds such us Golden Eagles, Black Vultures and Falcons. Our entire luggage will be transported by camels handled by Tuvan herders. Two thirds of the way into today’s trek, the views will open to majestic perspectives of Potanin and Alexander glaciers with the icy peaks of Khuiten (4374m), Nairamdal (4082m), Snowchurch (4071m), Malchin (4050m), and Ulgii (4113m) on their far side. This evening we camp at 2900m. The 4051m Malchin is the lowest of the Holy Peaks. We hike along the Potanin glacier moraine for an hour and start climbing on the scree of Malchin. Its ridgeline overlaps with the borderline of Mongolia and Russia and provides a spectacular bird’s eye view of the Potanin glacier, the glaciated peaks and Russia. Over to the west, weather permitting, you will see the massif of Mt.Belukha (4500m) lying in Russia. That is the absolute top of Altai mountain range. Back in camp, we reward ourselves with a tasty meal. Those opting to stay behind can relax in the camp and take the so-called Russian border walk, an easy climb on to a neighboring ridge that allows a glance into the territory of Russia. 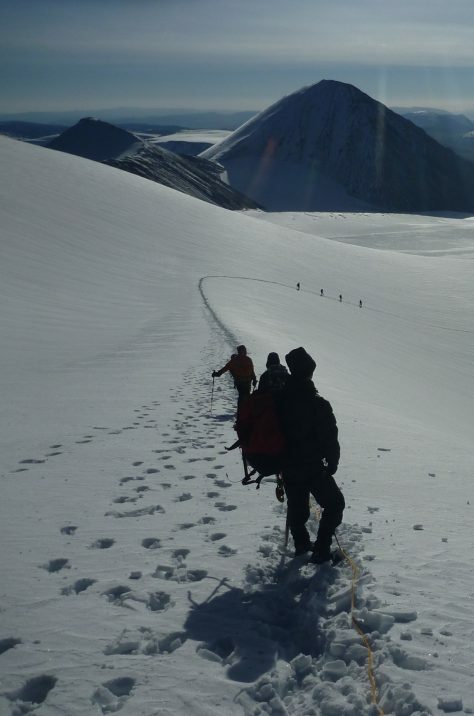 Assent up the Potanin Glacier to establish a high camp at the top of the Glacier, below the eastern face of Khuiten. We have to negotiate a number of crevasses before reaching the Khuiten’s foothill. Today we have an early start for our climb of Khuiten. The actual ascent, although technically moderate, takes 4 hours. From the summit there opens a tremendous bird’s eye view over China, Russia and the neighboring snowcapped ridges and snow fields. Return to High Camp. At first light, we make the straight assent of Naradel (friendship peak) and return to High Camp. After a quick cuppa and breakfast we break camp and decend down the Potanin Glacier to Base Camp for a rest in the afternoon sun. Rest day with an optional walk to Russian Border. Or contingency day. From Base Camp we will attempt the summit of Snow Church. This peak is fairly straightforward and we will return to Base Camp after the attempt – as well as each of the peak attempts. From Base Camp we will attempt the summit of Eagle Peak. This peak is fairly straightforward and we will return to Base Camp after the attempt. Today we hike back to our camp in the White River valley. This time it is a gradual descent along the White River which takes its source from the Potanin glacier. It is a chance to glance into every single valley of the icy massif and witness how the initial stream of glacial dust transforms into the mighty White river. We return back to our vehicles and celebrate our ascent. We say “goodbye” to our Tuvan friends and take a 7 hour drive back to Ulgy. Tonight is your chance to sleep in a local hotel. A hot shower and cold beers will be the highlight of the day. This morning we catch our return flight to Ulaanbaatar. On arrival, you will be transfered to your hotel. You’ll have a free afternoon for shopping and sightseeing. Morning visit to see the Chingis Khan statue. This is a 1.5 hour drive from UB city. The afternoon is free to spend for shopping and self-exploration of the city. You may refer to our recommendations in order to make most out of it. Tonight we will have a farewell dinner to celebrate the trip and our achievements. Transfer to UB airport for your return flight home. This itinerary is subject to minor changes – depending on flight arrival/departure times, weather, group dynamics, fitness and so forth. The itinerary outlined provides an excellent indication of the trek and what you will experience in this magnificent country. A 60-65L rucksack with a good waist belt. To carry all your kit and a proportion of you week’s food allocation along with your crampons, helmet, ice axe etc. We recommend B3 Mountaineering Boots. Ideally double boots like Skarpa Vegas or La Sportiva – Spantiks. With double boots you can take the inners out and sleep with them and keep them warm. Gore-Tex or eVent seam sealed and breathable are recommended and big enough to fit over your down jacket. This jacket will also serve as a great windproof too. A full length mattress is best, plus a closed cell foam mat underneath. What are the best flights to Ulaanbaatar? If coming from Europe, Aeroflot via Moscow is a good option. If coming from North America, Air China via Beijing is a good option. Those of you who want to add to the adventure could consider flying into Beijing and then catching the train to Ulaanbattar, taking around 27 hours to cover 1,500 kilometers. Note: Our high camp is at the top of a glaciated valley where we are camped on the ice. Single leather or synthetic boots freeze. With double boots you can take the inners out and sleep with them and keep them warm.